I wrote this answer to a patient on ACOR or Association of Cancer Online Resources to her questions about other's experience with transplants and CLL with the bad prognostic marker of 17p del. A HSCT is narrow road, but sometimes it's the best road and sometimes it's the only road, but it is always a narrow and difficult road. Have you contacted BMT-TALK@LISTSERV.ACOR.ORG? That's a start. Mine is bkoffman.blogspot.com ( not 17p but 11q CLL). I am here and doing OK 3 years post a rejected HSCT. Chonette Taylor and Dennis Bayer have done pretty well, but they don't have a blog that I know. And Susan's with CML http://www.caringbridge.org/visit/susanleigh is many years out, not without challenges, but living a big full life. IF YOU DON'T WANT ANY REAL BAD NEWS, STOP HERE. Prepare for a wild CLL/ transplant ride with Greg: http://www.caringbridge.org/visit/maddog23 He's a great writer too. My memory is distorted. As a doctor, I am often guided by the worst cases, as they are the ones you must learn from to best avoid repeating the dangerous moves. I am sure that I have forgotten other voices that have guided and comforted me by sharing their trials and trails. Please forgive me. Still despite all this bad news, actually odds are in your favor, but it is never easy. It is alway complicated and tough to decide and tougher to do. We are all in this together. Let me know if I can help- if I haven't too scared or depressed you too much. Many years ago, I read an article about Frank Sinatra having a cold. It was a big deal, with recording and performing dates upcoming. And for a man not known for his calm demeanor at the best of times, his sniffles didn't make the job of his entourage any easier. I knew I was at risk when I was stuck in the waiting room for a routine dental hygiene appointment (trying to be healthy and proactive with my teeth and gums) with a young child joyfully coughing and sneezing away, and with her mother dutifully reading to her. Every tenth or twentieth discharge of millions of viruses into the closed atmosphere from her snotty kid, mother would suggest that she cover her mouth, which was never actualized. I guess the thought counts. I guess I need to carry a N95 mask with me at all times, especially in flu season. I guess I now will worry how my battered immune system will handle this latest assault with nearly all my antibodies missing in action. Maybe my borrowed IVIG next week with be my rescuing cavalry charge. My chief complaint is mostly a miserable runny stuffy sneezy nose, just like the little girl I shared the air with a few days ago. Throw in some mild malaise and a not so bad sore throat and you get the picture: a head cold. My usual diet of cold raw veggies is of no interest when I feel this way. I want hot soup and tons of tea, and even more time to nap. Hopefully I have only a few more days or less of this gentle misery ahead of me. Hopefully my chest is not the next battlefield. I haven't time for this. I have work to do, but I also have bigger zucchinis to chop. I might also add descending more than a mile into the pit and reemerging impressed with what is possible and what is unknown and unknowable. The disconnect between how well I might look and feel and the growing burden of cancer in my gut challenges my intuitions of how the world and leukemia works. Fighting the hidden enemies is my new imperative, one I can not ignore or wish away. My doctors Forman and Kipps disagree on most everything, EXCEPT that I need therapy. Soon. I will be spending the next 2 to 3 months deciding what to do next. Doing nothing is not an option. Or at least not a very wise option, though it is certainly the most appealing in the short term. I will not let this decision consume me, but will try as best I can to detach myself from the process and argue as I would for a friend or patient. I will try to be calm in the face of imperfect choices and incomplete data. I will try to look beyond the immediate horizons to the best possible future. I will decide and move on. The second was shot when I was lecturing this week in Motown, after more than six years of fighting my CLL and ITP and after the very recent challenge of nodes pushing 10 centimeters in my gut. Have I changed much? You be the judge. I still have my grey hair and mustache. I still wear dark sweat shirts and grey scarves, though the new scarf is from my visit to Egypt and not from a mall. I still visit art museums wherever I travel, even when it is too cold and too difficult and makes no sense. What did art ever have to do with sense? I still gravitate to the modern art, and still love what Leger can teach us about being human souls in an increasingly mechanized and alienating world. Tomorrow I consult Dr. Forman about how a second transplant, still the only cure for my CLL. I will ask him when and how that fits into my treatment mix. 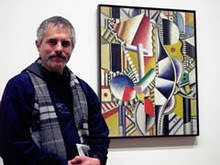 All that is missing is a third photo of me beside another painting by Leger, perhaps next time in Biot, France where his national museum is to be found. But that photo is at least five years off. That picture will be of me post CLL. Cured. Or at a minimum in a very long term deep remission. That picture will not be hiding any internal nodes or diseased marrow. You could zoom in using a billion pixels and never find a trace of my evil clone ready to explode again. because there will be no rogue sleeper cells. In that picture my hair may be thinner, I may be thinner, but my smile with be broader and my eyes brighter. In that photo I will be in my 70s, but I guarantee I will still be hungry for more art by Leger to delight in and more life to share. Stay with me until I share that photo. I guarantee a wild, informative and entertaining ride before and for many years after that next snapshot is posted. Karl asked I post a slightly more polished version with his signature. I am in Dearborn, having just finished two days of lectures and little thought about CLL- Ask me about sleep apnea or migraine or circadian problems and I am all over it, but CLL has been happily off my radar screen for a day or two. I am loving Hockeytown. There is a big hockey tournament in town so kids as young as 6 are found all through the hotel carrying their gear with help from lots of proud moms and dads. There is also a Star Trek convention here. Is this great or what? 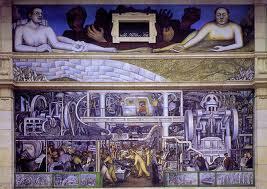 Saw the powerful Diego Rivera Courtyard at the Detroit Institute of Arts and went to a wonderful activist Sabbath service in an old downtown synagogue, then enjoyed a decent raw organic vegan meal. I was the only one there over 30, and the patrons were diverse to say the least. Next store, crowds in T-shirts and shorts or clown outfits were braving the bitter cold for what seemed to be a rave- I asked one of the freezing guys waiting in the que to get in: DJs, circus, lots of dancing and laughs. Sounds like a rave to me. Tonight it's Arab food. Dearborn has the largest Lebanese community on the USA. And I leave for the airport at 4:30 AM. Almost not worth going to bed. ... Which seems to apply pretty well to the indolent lymphomas and CLL. lymphoma can sometimes require a timely response. the odds of achieving the best results. to using milder therapies more often. lymphoma, or responsiveness to prior therapies. Karl is an excellent researcher and a very clear thinker. Take a look at what he has to say about the choices in an indolent cancer. This is the generic question I face. Do I hit the CLL hard and then dash to a transplant, and be cured or die trying or perhaps worse get a new difficult and sometimes incurable disease, graft versus host? Do I gently rap the cancer's knuckles with a slightly bigger stick than the rituximab which is no longer doing the job, but hold off on the big clubs to avoid peripheral damage to my already compromised marrow and immunity? Probably that means a clinical trial. Here is how Karl lays out the options. I will write soon on the specific details of what I need to deal with, what I can't ignore. "If treatment for cure is necessary; is it possible? If possible, is it necessary? "~ Dr Willet Whitmore (on prostate cancer). advanced lymphoma can sometimes require a timely response. therapeutic options and lower the odds of achieving the best results. My MR showed that my gut nodes that have grown too big, and need attention. Counts are good except for a mild persistent anemia. Kipps says I shouldn't ignore them or the ones he can palpate, but there is no urgency. The next step is a bone marrow biopsy and then probably a clinical trial at UCSD. All in the next 60 -90 days or so. Actually the next step is a nap. I always think clearer after a nap. And I write better too. It would be so great to get a long respite from decision overload. My longest rest from having to do something about my CLL was about first 12 months after I was diagnosed, and that hardly counts as I was running around getting contradictory opinions on what to do and not to do. I could use a break from this chess game. But that's not to be, and so I will nap and research and meditate and move on. It is a much better time to be pushed to treatment than say 4 years ago when I went for my transplant. Many more effective low toxicity choices now. But first, my nap. I love to nap, don't you? You give me reason to live, you give me a reason to live, you give me reason to live! Patty and I went on one of our best trip ever. It wasn't exotic China, not romantic Italy, not Zen Japan, not super natural New Zealand, not historic Prague or musical Vienna or friendly OZ, not ancient Israel and Egypt, not the castled United Kingdom, not magical Peru, not the grand Grand Canyon, but gritty occupied Oakland because that's where my daughter, son-in-law, and granddaughter live. That young lady with the pink bib in the picture is another reason to soldier on. I have no bucket list. As I have said before, I have way too much joy in each day and way too many things left undone to imagine that a list of the top 10 or top 100 or 1000 checked off would signal it's OK to check out. But seeing that four month old under the marriage chuppah might be a moment when I can say that I have seen enough. Nah, make that holding my first great grandchild. I should be in my 90s or close. If I live long enough to see that baby's bat mitzvah, I would be around the century mark. In any case, CLL would be a remote memory. What a blessing that would be. But now CLL is front and center. Tomorrow I have my MRI to see if my CLL is trying to launch a sneak attack from inside enemy lines, my mesenteric or gut nodes. If they have grown too big despite another course of rituximab, I need to knock them back to size while I still can. If they become "massive" ( >10 cm) they become harder to kill. In these large niches, they have more supportive infrastructure such as nurse cells and they are just tricker to reach with what ever toxic cocktail I have planned for their last meal. That means choosing a new treatment strategy that keeps one eye on my ITP, and another on my sleepy bone marrow and my third eye on a future transplant redux- probably my only chance to live long enough to see a fourth generation. I wish there was another way, but I am not convinced. Kinase inhibitors such as CAL 101 or immunomodulators such as Revlimid might buy some time, but not a cure. They don't promise me another 30 years. Only a second transplant gives me a 50/50 shot at getting really old. But a transplant demands a big price for that shot of redemption and a second transplant demands even more. I have been catching up on hours and hours of reading about my disease and transplant. CLL remains thankfully a hot research arena. Much is changing fast, but is it fast enough? I doubt it, at least for me and those of us who might need treatment soon. Those who have followed me on some or part of my six year journey know this is a repetitive loop- my anxiety before a scan or bone marrow biopsy, my cogitation over my next move, my lament about the slow progress and the constricted choices, and my hunger for life. I've got too many reasons to live and one very young, and beautiful new one.